The WEF report attributes the jump in India's ranking "to the momentum initiated by the election of Narendra Modi, whose pro-business, pro-growth, and anti-corruption stance has improved the business community's sentiment towards the government". The report, however, says if a constant sample of 135 countries is considered for both 2014-15 and 2015-16, India's ranking would remain unchanged at 55th. A big improvement was seen in the country's macroeconomic stability through the past year, with its ranking jumping 10 places to 91st in 2015-16. Part of this could reflect the recent moderation in inflation, the fall in the current account deficit and steps taken by the government to control its fiscal deficit. On infrastructure, the ranking moved up six notches - now, it ranks 29th on the quality of railroad infrastructure and 11th on the available airline seats per km. But on other key parameters, it fares poorly, ranking 61st on the quality of roads and 98th on electricity supply. The WEF report is rife with anomalies. Health and primary education is seen as an area of improvement, with India's ranking jumping 14 places. This is surprising, as on one of the indicators - quality of primary education - it ranks 52nd, which is at odds with various surveys such as the Annual Status of Education Report that show how poorly the country fares in this regard. 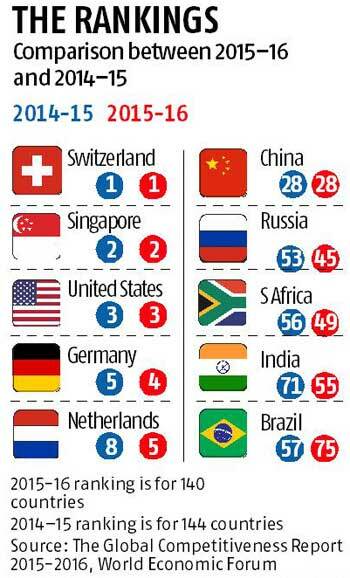 Among emerging economies: China (28th), South Africa (49th) and India (55th). The Global Competitiveness Index is an annual assessment to gauge the factors driving productivity and prosperity across 140 countries. It measures a country's performance on 12 pillars -institutions, infrastructure, macroeconomic environment, heath and primary education, higher education and training, goods market efficiency, labour market efficiency, financial market development, technological readiness, market size, business sophistication and innovation.